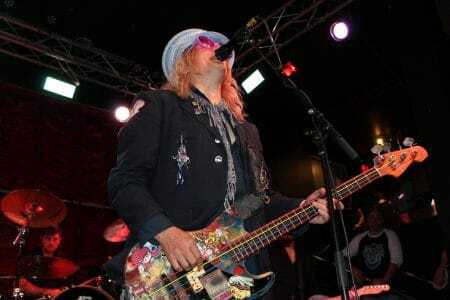 Enuff Z’Nuff frontman Chip Z’Nuff was recently interviewed by Jay Oakley of Just A Rock N Roll Junkie and he spoke about his plans for the upcoming year. In terms of Enuff Z’Nuff‘s next studio album which will follow Clowns Lounge, Chip Z’Nuff advised: “I’m going to save you all the cliché’s of what most of the bands use, our new record’s heavy, heavier, this is the greatest record we’ve ever put out, all the lame excuses for what people are to expect in the future. It’s a typical Enuff Z’Nuff’s record. The only difference is I’m singing all the songs. But, we wear our influences proudly on our sleeve, we always have and when people ask me what the new record’s like I always tell them because I want to save all the cliché’s for somebody else, I tell them to picture David Bowie and The Beatles fighting in an alley and Cheap Trick comes in and breaks it up. It’s a rock solid record that I think shows the best side of Enuff Z’Nuff glitter rock-wise and I think there is a lot of nice guitar on the record and some cool songs about everyday experiences I’ve went through and maybe you have as well and I’m looking to put the record out maybe in June or July of 2018 on our label which is called Frontiers Records and we’ll go out and tour extensively promoting the album the whole year. And, that’s the most exciting thing for me, is to be able not just make the records but to get out there and play them live. You can read the rest of the interview with Chip Z’Nuff at Just A Rock N Roll Junkie.